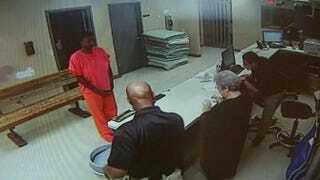 In the wake of her arrest after a July 2015 traffic stop, Sandra Bland is seen in a video screenshot standing before a desk at the Waller County Jail in Hempstead, Texas. Bland was found dead in her cell days after her arrest. The Waller County, Texas, jail where Sandra Bland died in July is in serious need of an upgrade, according to a report issued Tuesday by a panel put together after Bland's death, the Associated Press reports. The panel noted that the jail needs a new building, more expertise is needed among staffers in identifying mental-health issues, and body cameras and anger-management training are needed for jailers. As AP notes, the Waller County Sheriff's Office agreed to have outside experts review the county jail in Hempstead, Texas, after Bland died three days after being arrested. Her death was ruled a suicide, with authorities saying that she was found hanging from a jail-cell partition with a plastic garbage bag around her neck. There have been questions about whether conditions at the jail had anything to do with her death. The panelists didn't speak much to Bland's specific case but recommended better mental-health screenings across the board, as well as better overall treatment of inmates. Former U.S. Rep. Craig Washington, one of the panelists, said that anyone entering the jail was "entitled to be treated with dignity and respect as a human being." In order to accommodate that, there would need to be a new building with more space. "The jail is not adequate, in our judgment," Washington said, according to AP. The panel also recommended that the sheriff's office develop a policy for storing video footage and purchase body cameras, and that the jail employ medical personnel who can adequately screen incoming inmates for mental-health issues. All jailers should participate in anger-management courses and routine evaluations, the panel continued. Bland did signal on an intake questionnaire that she once tried to kill herself and was on medication for epilepsy. After her death, the Texas Commission on Jail Standards cited the Waller County Jail for not checking in on inmates in person at least once every hour, and not documenting that jailers had been through adequate training for dealing with potentially suicidal inmates. Waller County Sheriff Glenn Smith said that he was already starting to work on implementing parts of the recommendations. He said that jail staff would undergo "de-escalation" training in June and that the county has already applied for a state grant to purchase the recommended body cameras, the newswire notes. "I'm open, willing to listen, and while we may not all agree on everything … we're going to move forward," Smith said. "We're going to make a difference."